Beth Lapointe has her hands full--her teenaged sister is struggling with new motherhood, her job as a waitress is becoming more strenuous as her boss is pulled in different directions, and her alcoholic father is demanding she help him or he’ll return to Bluestone. The last thing she needs is her high school sweetheart to show up live and in person and to realize she still has feelings for him. 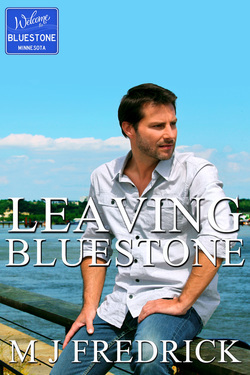 Country singer Maddox Bradley has returned to Bluestone, the only place he’s ever known peace. A car accident has the tabloids speculating over whether he’s drinking again, so he heads to the town where he used to spend his summer vacations. The town where he fell in love for the first time. He's surprised Beth is still there, but pleased. When he finds out she needs help, he wants nothing more than to give it to her, to make up for leaving her behind all those years ago. But is she willing to take it from a recovering alcoholic who has no plans to stick around? Lily Prater is the heart of Bluestone. As the owner of the landing where people dock their boats, rent a launch or a cabin, she has a lot invested in the town. She’s fighting hard to save her town, hit hard by the recession. Her mind is always spinning with ideas, ideas she can usually get Quinn to help her carry out. They work together on the summer celebrations, the outdoor movies, the winter carnival, the tension growing between them. 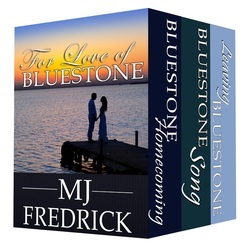 For Love of Bluestone is a collection of the three Welcome to Bluestone novels previously released as three complete novels. Fall in love with Bluestone Lake, Minnesota, and the people who are trying to keep her alive. 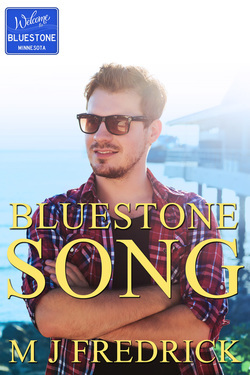 The Bluestone Series is my first trilogy. The idea came to me when visiting my dad and step-mom in Minnesota. We were driving back to Minneapolis from their lake house "up north" and passed a log cabin bar with a for sale sign out front. My step-mother said, "He's been trying to sell that place for years." By the time we got back to Minneapolis, I had the trilogy sketched out, including who "he" was, and why he'd been trying to sell his bar for years. Here are some pictures I took when I was in Minnesota, to give you an idea of how I picture Bluestone.